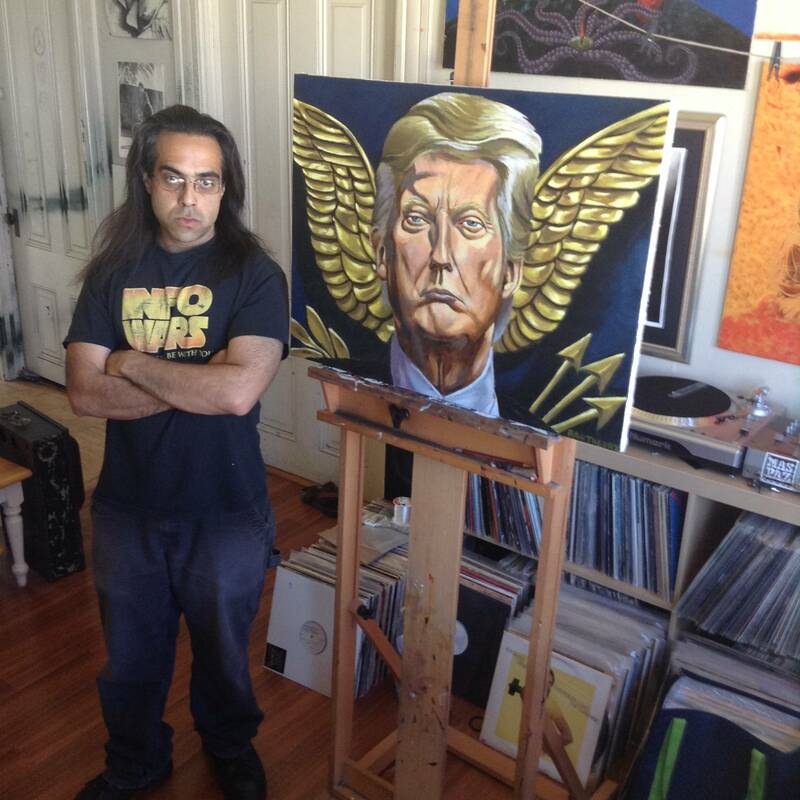 Oakland is a tough place to be a right-wing artist, but Jon Proby lives and works there just the same. 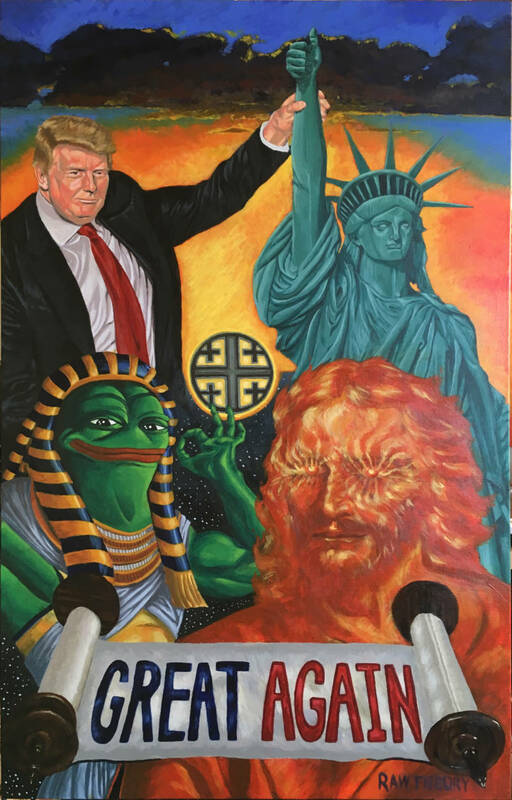 The hell-raising painter incorporates symbols like the Christian cross, the American flag, and Pepe the Frog (a symbol closely associated with the White Supremacist movement) as well as Tarot-card style iconography into his works to send out pull-no-punches political messages about everything from civil rights to Barack Obama. Recently, Proby's canvases were part of the controversial, pro-Trump #DaddyWillSaveUs art exhibition in New York City, where he presented his paintings alongside such attention-grabbing works as provocateur Milo Yiannopoulos' performance art stunt involving pig's blood and a bathtub. 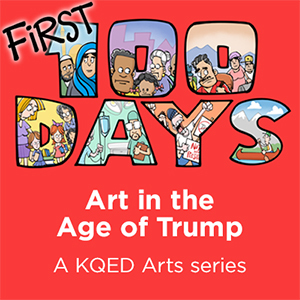 KQED reached out to Proby to find out about the underpinnings of his process and political message, as well as hear about what it's like to be a right-wing artist in left-leaning Oakland. You were born and raised in Los Angeles and now live in Oakland. political artist over the years? individual, I've drifted further to the right. The intensely leftist nature of California city life has re-enforced my contrarian position. and quickest way to communicate my philosophy while showing the world that that the left doesn't have exclusive rights to the art world. My goal is to communicate to the audience through symbolism. Sometimes that means Tarot-like compositions that speak on a specific theme. Sometimes its a portrait that is framed in a way that translates my sentiment about a specific person. I build my own frames and I stretch my own canvas. I prep each canvas with gesso (a substance artists use to prime their canvases before painting on them) and I draw directly on the canvas with Conté crayons before I apply paint. For now, as I grow with the medium, it's more of an illustrative process than a painterly one. It can take two weeks to two months to finish a piece depending on its complexity. How did you learn to be an artist? attended Los Angeles County High School for the Arts, spent two years at an arts college and also undertook independent study in private and community college classes focused primarily on figure drawing. justice. What role do these symbols play? symbols that affect both our conscious and sub-conscious minds. 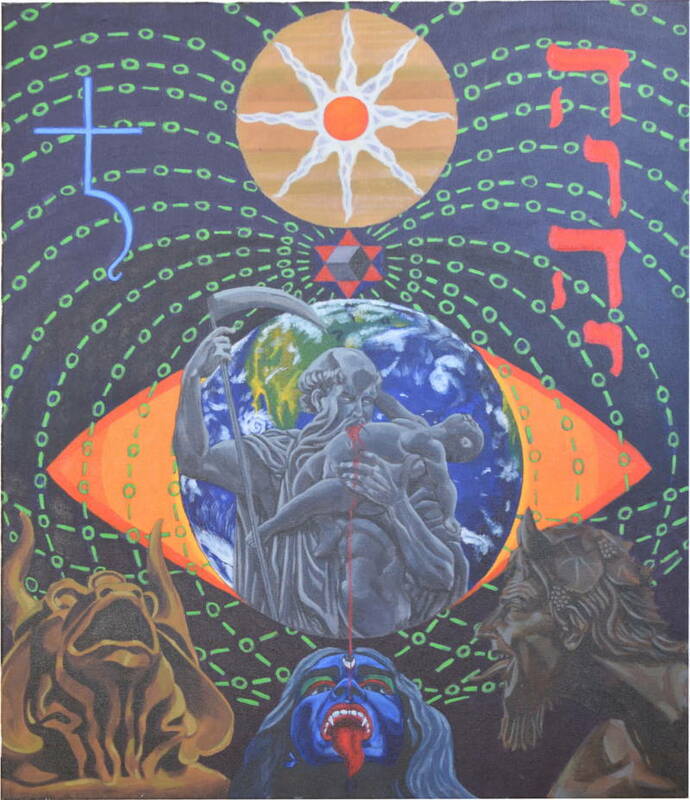 Thus I intentionally imbue my work with the symbols that I see as being most relevant to our place in western civilization, whether the subject matter is dark or light. Symbols are power. controversial, pro-Trump art show that opened last fall in New York in which you participated? I was able to mingle and network it a large crowd of like minds, which is something I'd never experienced before. 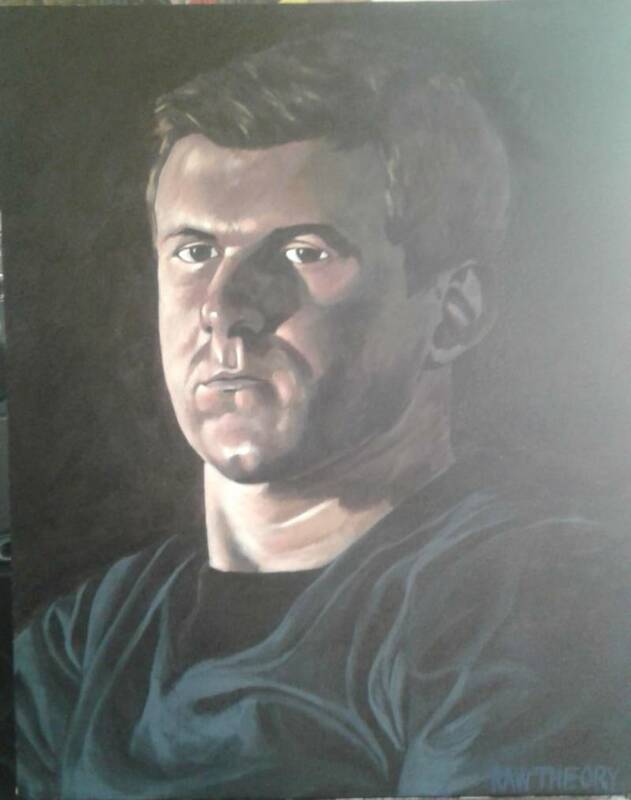 But it was also illuminating as to how biased against the right the media is, because nearly no news outlet that covered the show featured my work or my words; my work would have legitimized the idea that right wing fine art is a reality in America. extent have you had to deal with enraged feedback? Have you ever felt persecuted? discrimination there is both within the art world and without in California, so I don't even bother. My avenues to exposure are exclusively online and on social media. clear-cut target in the Obama Administration? Its only different in the sense that there is finally an administration that I can support for the first time in my life. Other than that, my goals remain the same: communicate the truth through symbols, and no one is above my critique. If Trump drifts too far off course, he will be the subject of heavy artistic criticism just as Obama was. Who are the artists you most admire and why? I admire Ben Garrison the cartoonist for his work ethic and commitment to principles even in the face of persecution. He will go down in history as one the most influential political artists of the modern era. change people’s minds with your work versus rallying those who share your opinions? of the past 100 days? Why? materials. I'll have to see what happens.